“Cancer”…no such thing in Chinese Medicine! Constance Fraatz is a dear friend of mine and a skilled acupuncture specialist. In her lifetime she has unfortunately had to deal with cancer in some of her closest family members. Constance was kind enough to offer her expertise at our Know Cancer “Community Awareness Fair” on February 22nd of this year…and her display of dedication to giving back through health, well being and Chinese Medicine was truly inspiring. Here is some insight she provided for the Know Cancer Community…enjoy! “Cancer” is a modern day term and has no parallel word in Chinese Medicine. However, the recognition and study of “lui” (tumors) and “zhong” (swellings), was given ample discussion in one of the earliest treatises on Traditional Chinese Medicine (TCM). The three key elements, according to TCM, in the development of tumors are: Qi Stagnation and Blood Stasis, Accumulation and binding of Heat Toxins, and Deficiency of Vital (Zheng) Qi, all of which can be treated with a combination of Acupuncture and Chinese Herbal Medicine. But in order to treat cancer properly the practitioner needs to put two major concepts of Chinese Medicine into play: 1) The concept of ”Holism” – seeing the individual as a whole entity in relationship to an environment and not simply a list of individual symptoms and 2) The idea this holistic picture forms a pattern. When we diagnose in TCM we are discerning an overall “pattern of disharmony” in the body. We take all seemingly unrelated symptoms and look at the whole picture of a life – physical, mental and emotional in relationship to environment. This is how we arrive at the root cause of dis-ease. For cancer patients and survivors, what this boils down to is determining not only the cause of the cancer but recognizing a path to wellness. Supporting the Vital Qi of the body is of particular importance in all stages of cancer. In the beginning when the individual is still strong and healthy and the immune system not as compromised, we are able to clear heat toxins, dampness and phlegm (also recognized as a factor) and break up Qi and Blood Stagnation more vigorously. In later stages of the disease and after a remission or cure has been achieved, we need to more strongly support the body’s Vital Qi (boosting the immune system) as well as moving Qi and Blood so as to prevent further stagnation and hence a reoccurrence of the tumors. 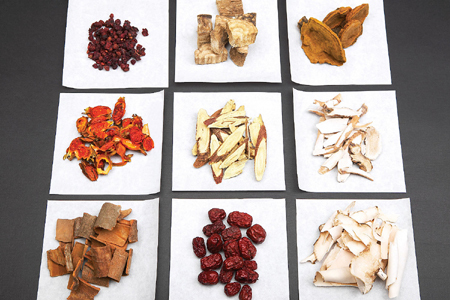 Additionally, Traditional Chinese Medicine works synergistically with Western medical methods to alleviate symptoms irrespective of the patient’s physical condition or disease stage. One source of information about acupuncture and cancer is the National Cancer Institute’s web site where they state, “According to a panel of experts at a National Institutes of Health (NIH) Consensus Conference in November 1997, acupuncture has been found to be effective in the management of chemotherapy-associated nausea and vomiting and in controlling pain associated with surgery.” In short, I believe using an integrated approach to cancer and cancer prevention is the future of oncology. Eastern Medicine can be used to support the immune system, alleviate pain, nausea, and fatigue, while at the same time, serve as a powerful ally to chemo and radiation therapies – actually boosting the effectiveness of the Western approach. But I urge you – Don’t wait until you develop cancer – Prevention is what Oriental Medicine is all about. Qi Stagnation is the fundamental root of all cancers. Qi Stagnation causes blood stagnation which in turn causes heat buildup with the possibility of toxins being formed. As a result of Qi stagnation, dampness & phlegm accumulate. Ultimately your body is robbed of its Vital Energy. Stress is the #1 cause of Qi Stagnation. Unfortunately, in today’s world, if you’re alive you have stress. Do something about it: Take a deep breath, take a noontime walk in nature, alkalize your diet, take up yoga, Tai Chi or Qi Gong practice – buy yourself roses! – AND – check into Traditional Oriental Medicine and let the Qi flow! You can currently find Constance practicing acupuncture at Still Waters Healing Center in Orlando, FL. Feel free to look her up or give her a call to set up your own visit…she is wonderful!